The Sydney Symphony Orchestra played three of Einojuhani Rautavaara’s works. The first Cantus arcticus – Concerto for birds and orchestra uses recordings of bird song as an instrument to very great effect. I bought box sets of Rautavaara’s 12 Concertos and Choral Works later. The Alim Qasimov Ensemble features Alim and his daughter Fargana as vocalists and Rafael Asgarov, Rauf Islamov, Javidan Nabiyev, and Zaki Valiyev playing a range of traditional instruments. The music is, the programme told me, something of a fusion of the classical mugham and more popular ashiq musical traditions of Azerbaijan. However it comes about the concert was great (and the Spiritual Music of Azerbaijan album is great too). Dalmatica: Chants of the Adriatic is a collaboration between two groups: Dialogos, a group of four female singers, and Kantaduri, a group of six Croatian cantors. The programme explores Dalmatian liturgical musical traditions from the middle ages which use both Latin and church Slavonic. This was a really, really good concert and I will be surprised if Ispovidajte se Gospodinu, jer je dobar (track one on the Dalmatica CD or listen to the Youtube video embedded above) is not amongst my 5 favourite tracks for 2017. 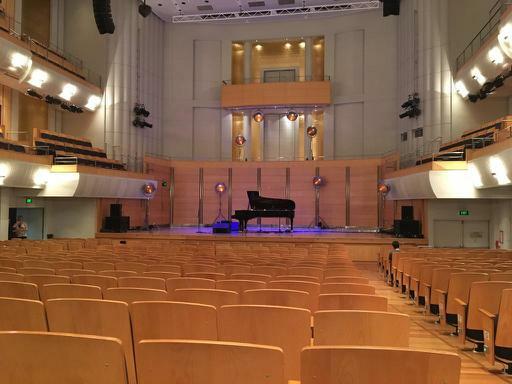 The last Sydney Festival concert I went to was Ukrainian-Canadian Lubomyr Melnyk playing something of an introduction to his piano music, particularly his technique of “continuous music”. He spoke quite a bit between pieces – and said some things I found quite strange – but the music was amazing. If the 3% of the programme I saw is any indication the 2017 Sydney Festival was excellent and I’m already looking forward to 2018! This post was published on March 24, 2017 and last modified on April 4, 2019. It is tagged with: events, festival, music.